STEPHAN Schrock found out it wasn’t going to be easy as everyone expected it would be for him in the United Football League Cup. 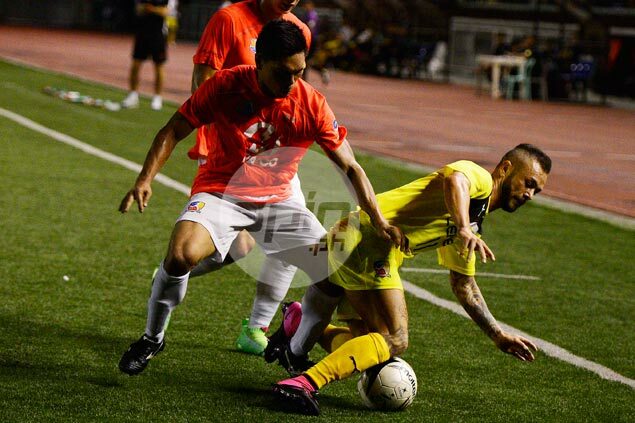 The Azkals star, on loan from his German second-tier club Greuther Furth, wound up with a scoreless debut for Ceres-La Salle in its 2-1 victory over Loyola Meralco on Sunday night. While he conjured some chances that left the crowd in awe, Schrock failed to find the back of the net in 90 minutes on the field, although the Filipino-German standout still flashed his impressive dribbling and pinpoint passing that almost led to goals. “It's a different game for him from Germany to here, positioning-wise, everything's different for him but hopefully day by day, game by game, he'll be accustomed to Philippine football,” Ceres coach Ali Go said. The 5-foot-7 Schrock, usually playing at midfield or defense in Germany, was thrust up front as well as in the wings in his first outing for Ceres. “We're still looking at the best position where we can play him best,” Go said. “In a few more games, if we qualify for the quarterfinals, I think he's going to be accustomed already to Philippine football and Asian football,” he added. Schrock, who arrived late last month, admitted it’s going to take some time to adapt to the local style of play. “I’ve been here for fifteen, sixteen days so it’s still a long way to go until I adjust one-hundred percent to everything: to the style, conditions, and to the team as well,” the former Bundesliga campaigner said. “But if we win, I’m happy,” the 29-year-old booter added with a smile.